Decision Point. Which river is the true Missouri? Answer below! We headed out of Fort Benton towards the town of Loma and the famous Decision Point. This beautiful spot is the confluence of the Missouri River with the Marias River. It’s the first point in the journey at which Meriwether Lewis and William Clark found something completely unexpected, and it would prove the first true test of their ability to make good decisions. We have been to Decision Point twice. The first time, we were with a big tour group. On the second visit, as we hiked up to the lonely, windswept overlook, we were the only people in sight in a vast landscape. I wonder whether the isolation and remoteness we felt was akin to that weighing on the captains, or if the bustle and cheer of the men in camp made the place more like it was when we were here with the group? 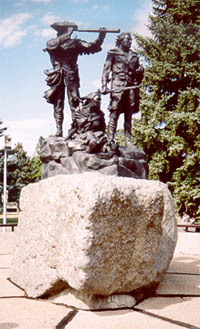 Lewis and Clark had reached the furthest point of white exploration of the west when they reached the Mandan villages near present-day Washburn, North Dakota. During the winter they spent there, they interviewed the Mandans and Hidatsas extensively about everything they knew about points further west. In April 1805, they packed up and headed up the Missouri again, and for the first two months, they had a lot of hard work but no real surprises (except for the grizzly bears). The rivers and mountains were pretty much where the Indians had said they would be. An interesting question was now to be determined; which of these rivers was the Missouri, or that river which the Minnetares call Amahte Arz zha or Missouri, and which they had discribed to us as approaching very near to the Columbia river. To mistake the stream at this period of the season, two months of the traveling season having now elapsed, and to ascend such stream to the rocky Mountain or perhaps much further before we could inform ourselves whether it did approach the Columbia or not, and then be obliged to return and take the other stream would not only loose us the whole of this season but would probably so dishearten the party that it might defeat the expedition altogether. Capt. C & myself stroled out to the top of the hights in the fork of these rivers from whence we had an extensive and most inchanting view; the country in every derection around us was one vast plain in which innumerable herds of Buffalow were seen attended by their shepperds the wolves; the solatary antelope which now had their young were distributed over it’s face; some herds of Elk were also seen; the verdure perfectly cloathed the ground. 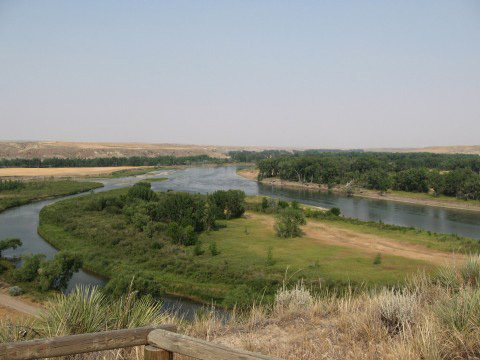 Lewis and Clark both had extensive knowledge of geography: based on their observations, they believed that the southern river (the one on the right) was the Missouri River. The new river (top and left in the picture) was too slow and muddy to have its headwaters in the mountains; it looked for all the world like another plains tributary. But to a man, the Corps was convinced otherwise, and for the same reasons cited by the captains. After all, they had been paddling and poling up the Missouri for more than 2000 miles. They ought to know “the Big Muddy.” It made sense that the river that looked like the Missouri, smelled like the Missouri, and flowed like the Missouri, was the Missouri. You might think that Lewis and Clark simply ordered the men to get their butts in the boats and paddle up the south branch. But they almost never operated that way. Instead, they took the time to respect the views of the men and to expand their own knowledge. After all, the men might be right — a result which would certainly lead to an erosion of confidence in their leadership skills, which as Lewis had perceived from the start, might be fatal to the entire expedition. Instead, Lewis took a small team on an extensive reconnaissance up the Marias, while Clark took another group up the Missouri branch. By the second day, Clark had traveled 55 miles and was completely convinced that he was on the river they needed to follow. He returned to camp. Lewis did not have it so easy. He and the men traveled 70 miles on foot (in two days!) before concluding that the north branch swung too far to the north to lead to the mountains. Lewis was so convinced that this was a new river that he gave it the name it still bears today: Maria’s River, after a favorite cousin back home, Maria Wood (pronounced mar-EYE-ah). On turning about I found it was Windsor who had sliped and fallen abut the center of this narrow pass and was lying prostrate on his belley, with his wright hand arm and leg over the precipice while he was holding on with the left arm and foot as well as he could which appeared to be with much difficulty. I discovered his danger and the trepedation which he was in gave me still further concern for I expected every instant to see him loose his strength and slip off; altho’ much allarmed at his situation I disguised my feelings and spoke very calmly to him and assured him that he was in no kind of danger, to take the knife out of his belt behind him with his wright hand and dig a hole with it in the face of the bank to receive his wright foot which he did and then raised himself to his knees; I then directed him to take off his mockersons and to come forward on his hands and knees holding the knife in one hand and the gun in the other this he happily effected and escaped. Lewis and Clark continued to respect the men’s views even though they now had little doubt about their course. They knew the men had to be worried about being stranded in some strange place, miles from the mountains or the Columbia River. Clark got the boats ready and reestablished the routine, leading the men onward on what he was convinced was the true Missouri. Lewis took a small team and went ahead on foot, determined to find one of the landmarks described to them by the Indians. Two days later he found the magnificent Great Falls of the Missouri. But that’s a story for another time. Note: It’s worth pointing out that the Marias was much larger in Lewis and Clark’s day than it appears today. Modern-day damming has narrowed the river’s channel; in addition, the river would have been in flood stage in June when the Corps of Discovery found the river. This accounts for the Indians’ failure to mention what was normally a fairly minor stream.